Careers in sport management, administration, analytics, venue and event management are as thrilling as watching your team win the World Series. 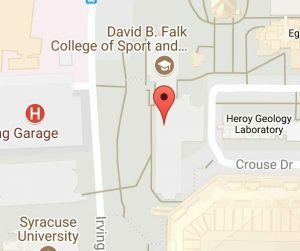 With a degree from Syracuse University Falk College, you’ll be prepared to enter the fast-paced world of professional and collegiate sports. Ask us what makes our sport management programs different. Falk College is most grateful for contributions at all levels. Gifts are our most powerful tool to help students in need, develop programs of excellence, and support outstanding faculty within the department of Sport Management (SPM). If you are an alumni of our Falk College family, you have an open invitation to come back to SU, and more specifically to Falk College. Maybe you’d like to give back by presenting a lecture in your field of expertise to current students. Or perhaps you could mentor a student by sharing your experiences to help them make life-changing decisions. We always welcome financial support, but equally appreciate the value a personal story our alumni can offer to shape the SU experience for our future alums.